PLOT: After the St. Patrick’s Day parade gets out of control, Springfield reinstates Prohibition, inspiring Homer to be the sole source of alcohol, adopting the moniker as “The Beer Baron”. This episode is pure hilarity. There is no emotional journey any character makes. There is no lesson (except maybe that Prohibition is stupid). Its just unadulterated Simpsons humor at its best. As the plot description summarizes, this episode tales the tale of the short-lived Prohibition that befalls Springfield after a chaotic St. Patrick’s Day Parade; one in which sweet, lovable Bart accidentally gets drunk. As the town looks for an answer for their alcohol craving, Homer takes matters into his own hands and becomes the Beer Baron, and thusly, keeps the townspeople pleasantly soused. Town officials call in Rex Banner to help stop the underground drinking, but it turns out Banner is just as hapless as the rest of the police force. This episode is really strange when you take a step back and look at it. Major things happen in it, but all go back to status quo in the 22-minute runtime and the show carries on as if nothing has happened. This show, like most sitcoms, do not have any long-running story arcs; even so much as taking metaphysical pot shots at times at the “return-to-normal” structure of the episode (See: “Homer Loves Flanders”), but for some reason, this one is sticking out to me as a special case of this. This is probably partly do to the fact that the episode employs a sparing use of a 1920s-era voiceover, which makes it feel like it is taking place back during America’s original Prohibition Era. It could also be because the plot is based heavily on the introduction of Rex Banner, an Elliot Ness-type trying to catch Homer in the act; a character we meet and who is quickly given a permanent sendoff. This quick exit is reminiscent of other one-shot characters – Frank Grimes and “The Real” Seymour Skinner – who shake up the fabric of the show, only to watch it snap back into place. It’s always fun to see Homer succeed and this is one of his greatest schemes. Its great to watch all the creative ways he delivers the beer, thanks in large part to an underground Rube Goldberg machine that connects the bowling alley with Moe’s Tavern. Its so utterly far-fetched that its just pure genius. Rex Banner is a fantastic single-episode character, playing the comic foil to one of Homer’s shining achievements. He’s just the straight-laced sap you love to watch get bested, even if he means well. Watch this episode drunk, as it will make you feel like it’s the proper thing to do. PLOT: In order to keep his job at the power plant, Homer must go to college. With hilarious results. I have to imagine that the writers were chomping at the bit to do a college episode. The staff has often been flooded with alums from Harvard and were former writers of The Harvard Lampoon (including episode writer Conan O’Brien), of which National Lampoon was spun-off from. As in: National Lampoon’s “Animal House”, the movie that molded the outsider’s belief of what college is supposed to be like. This includes Homer, who believes, when he’s ordered to go to college, that his life is about to become party central. What’s great about this episode is the humor that comes out of Homer’s attempt to live the college life he’s always dreamed about: filled with partying, pranks, and crusty old deans. I love how the episode turns the college movie genre on its head, replacing the classic “Jocks vs. Nerds” storyline with a bunch of… well, nerds, trying to get work done as Homer makes it nearly impossible for everyone. And it is this obnoxiousness of Homer that makes it so fantastically funny. This is about as classic as it comes and its just oh so quotable. PLOT: When Miss Hoover is out for an extended period of time, Lisa develops a crush on the substitute, Mr. Bergstrom. This is the quintessential Lisa episode and arguably, the most emotional episode in the history of the show. This is the writers’ finest moment of storytelling and it is the Gold Standard of any emotional episode that came later. Honestly, although it ranks 8th on this list, I could have just as easily put this as the top entry. The plot is a simple story of unrequited love at its most basic, but simplifying the emotional journey of Lisa as a schoolgirl crush just isn’t fair. Mr. Bergstrom awakens a feeling of self-worth in Lisa that no other person has ever been able to accomplish with her. Thinking back, maybe Bleeding Gums Murphy has a comparable effect, but not to this magnitude. It is a heartbreaking story, as Lisa has to say goodbye to him before she is ready; if they had killed him off, the feeling would be no different. But what is so powerful are all the moments leading up to the bittersweet finale. From winning his cowboy hat in a contest to her own private tour of the museum to making her believe in her sax playing, it’s a touching story that culminates in, even just for the rest of the episode, Lisa believing she is someone special. She IS Lisa Simpson. There’s also a pretty decent b-story involving Bart’s attempt to become class president. This story really takes a back seat to the main story, but it definitely had enough promise to warrant a full episode. Bart vs. Martin is always a pretty good storyline from early episodes and its almost a disservice to be paired with such an iconic Lisa story. I almost forgot that it was in this episode. Dustin Hoffman aka Sam Etic gives an incredible performance as Mr. Bergstrom. Not often are guest stars asked to provide this dynamic of a performance with as much emotion backing it, but Hoffman delivers, as he usually does. He laughs, he cries, he creates a three-dimensional character that, sadly, only sticks around for this single episode. This is easily one of the top three one-shot guest appearances in the show’s history and it set the bar for the following two decades plus of celebrity cameos. PLOT: Homer befriends an outgoing man named John, then freaks out when he finds out John is gay. One of the things that made The Simpsons so groundbreaking is the fact that it was one of the first of its kind: a socially-aware cartoon. This episode aired in February of 1997, months before South Park aired its first episode, and seasons before it became the socially-conscious satire that it is known as today. An animated show tackling the issue of homosexuality nowadays is rare; back in 1997, it was unheard of. Mind you, this was the same year that Ellen came out of the closet in real life and on her show. Her show never recovered. This episode tackles homosexuality and, more accurately, homophobia, in a style which is very Simpsons. Both sides of the coin are magnified 100 times over, exposing what should be a non-issue for the farce that it is. This has to do with the fact that this issue is looked at through Homer’s ignorant gaze, as the homosexuals in his world are as FLAAAAMING as his beer is cold. The episode pokes fun at the hypocrisy of homophobia. Homer instantly develops a bond and friendship with John, a perfectly nice man with an infectious personality. He is no doubt gay to everyone but Homer, who I guess, expects gays to be leather-clad 24/7. Its an interesting character turn to see Homer go from friendly to blindingly disliking his former friend. A turn, that thankfully, Homer goes back on, in his own ignorant way. The hilarity and absurdity of this episode really centers on Homer and Bart’s relationship as Homer, fearing Bart may be gay, takes him on a tour of, what he is hoping, are the manliest places in Springfield. What he comes upon, however, is the absolutely gayest steel mills in the history of homosexuality or steel. John Waters gives a very fine performance in the episode, more or less, playing himself. More importantly, in this exaggerated world of straight and gay, he is the voice of reason that sexual preference does not make you who you are. 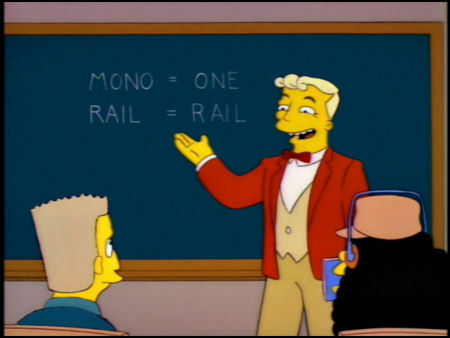 PLOT: When Springfield comes into some money, a traveling salesman persuades them to spend it on a monorail. This episode is great for so many reasons and its status as one of the most iconic episodes in the show’s run cannot be disputed. Phil Hartman never disappoints and here is another fantastic performance that the late comic gave to us. It is him at his best and it is such a shame that we lost him. Marge: Homer! There’s someone here who says he can help you. I also like Marge here. She gets a bit more to do than she usually does as the one townsperson that is skeptical of Lanley and the monorail. Its a pretty nice turn by her as she helps Homer save the day.